Blend the cream cheese with the evaporated milk and condensed milk. Add the maraschino cherries’ syrup and blend. Add the cherries and blend for a few seconds, so that the cherries are not pureed. In a small pot, add 1/2 cup of water and bring to a boil. Remove from heat, add the unflavored gelatin and stir until completely dissolved. Add the cream cheese mixture and stir well. Arrange the berries and pour the mixture into a gelatin mold or, if you prefer, into individual cups. Chill for at least 3 hours before serving. You can replace the berries with a fruit cocktail. You can also omit the maraschino cherries. 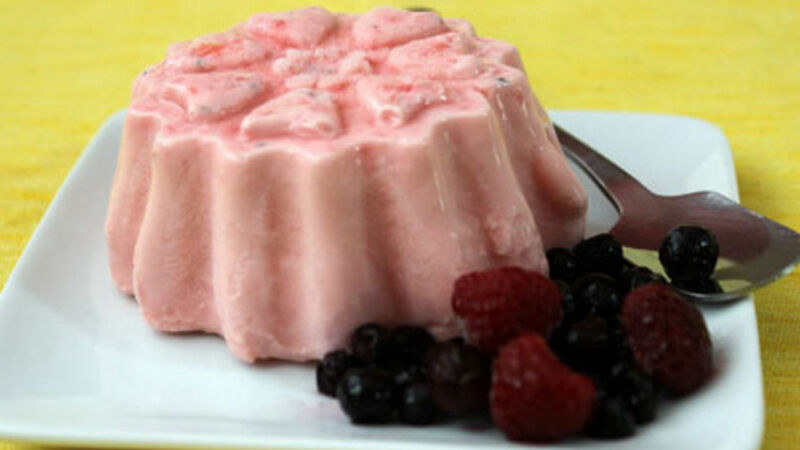 Summer is an ideal season to enjoy desserts that are easy to prepare, like this gelatin with a texture that’s similar to fruit yogurt. I find myself making all sorts of combinations. This time, I used cherries and berries, but you can choose whichever fruits you prefer.